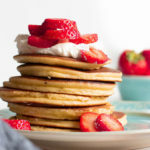 Your mornings just got that MUCH BETTER with these super easy and crazy fluffy low carb pancakes -- made of almond flour and cream cheese for that nostalgic treat we all love and crave! Place all ingredients (except butter) in a blender, in the order listed above. Blend until ingredients are thoroughly combined — I usually stop my blender halfway through to scrape the sides, the dry ingredients like to stick in the corners and under the blade. In a large nonstick skillet, melt a thin layer of butter over medium heat. Pour the batter into your pan. I pour my pancakes one at a time in the center to keep them pretty! Cook for about 3-4 minutes, or until your pancakes flip easily. Flip to cook the other side. This side usually cooks a little faster, about 2 minutes. Your pancakes are done when they’re golden brown and cooked through. Place on a plate and continue cooking the rest of the batter. Serve warm with low carb fruits, sugar free whipped cream or sugar free syrup and enjoy! Serving size is for 1 pancake if you make 8 pancakes from the batter. Feel free to leave out the sweetener, if you don't want you pancakes to be sweet.